Today marks the official 1 month anniversary of The College LifeStylist, but thats not the only feat of the day. I also reached over 1000 readers today (now up to 1500 and climbing, cue fan-girling.) In honor of my 1-month I want to share with you current or potential bloggers out there how I survived my first month and how I was, in my opinion, successful. Before I started my blog I did research on what platform to start it on, as well as googling potential blog names to make sure no one else had already snagged the one I wanted. Once you have an idea for your blog, like what type of blog you want to have, and a name for your blog, you're ready to begin! In my research for what platform to start my blog on I found Squarespace, a paid domain and website creator. Squarespace allows you to develop your website for 14 days, for free, then you have to decide whether or not you wish to pay and publish your site. If you don't want to start of paying for a domain I highly recommend Wordpress for a starter site. If you use or are thinking about using Blogspot, you should switch to Wordpress immediately. During my research I found that Blogspot can delete your blog whenever they want without your consent or notice. Wordpress is free, just like Blogspot, and can allow you to personalize your site slightly better than Blogspot. If you're thinking about, or have already started, a blog you obviously want to enjoy it, so a huge tip for content is to publish what you like; but you still have to keep in mind a potential audience. Blogs are not diaries, and bloggers don't want their blog to just be a personal outlet (come on you established bloggers we all love that feeling you get when you see people actually enjoying what you have to say.) When writing content write about what inspires you, but try to keep in mind that thousands of people might see it one day, and you want them to be able to relate. My next tip for content is to make sure you write in your voice. We all speak differently than the person next to us, so your blog shouldn't sound like the URL down the Google scroll. One way people can relate to you and your posts is when they feel like your talking to them, and can get a feel for your personality. The the answer to, "how often should I publish?" is however often you can. How much you post isn't nearly as important as how consistently you post. I chose to publish every night at 9pm. If you can't publish everyday then set a goal for yourself: once a week, Monday-Wednesday-Friday, etc. Having a set, and known, time for posting allows you to have a definitive deadline, as well as gives your potential readers a specific time to look forward to reading what you're publishing. If you find yourself with a large amount of free time one day, sit down and write out a couple of posts. Having some prewritten posts can really help when you have a deadline to meet but have no time. Social media is the biggest tool to promoting your blog. I use all of the major social media sites: Twitter, Facebook, Instagram, Pinterest, and Google+, to promote my blog. I made the decision to create a second Twitter and Instagram account, and to create a separate page on Facebook, rather than use my personal profiles. Discover what works for you, and once you do install the widgets onto your site. Whatever server you deice to use will allow you to put direct links to your social media sites right on your page. Pinterest has been my biggest referrer, so I highly recommend using Pinterest for your site. 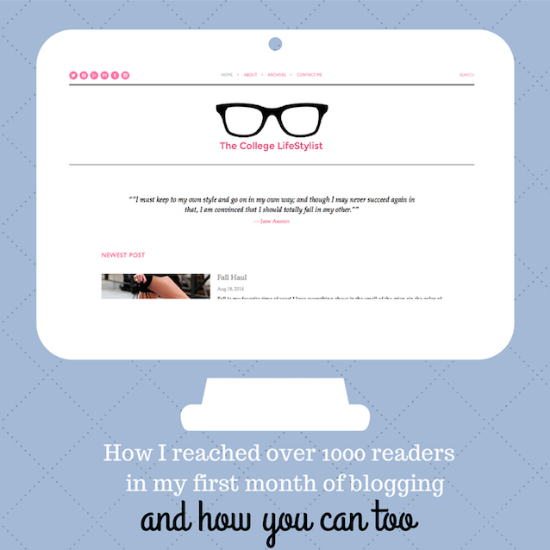 The biggest tip I can give anyone just beginning their first month of blogging is not to give up on yourself. If you look at your favorite blogs and see that they have thousands of followers and hundreds of comments on their posts, tons of retweets and page likes, you might get discouraged. I know I did. But then I realized you can't compare your new blog to someone else's, you never know how long it took them to get to where they are. Some days you'll have no viewers, other days you may have 50, but no matter what the ups and downs in your viewership is, stay positive. As long as you stay true to yourself and stick to your goals you will accomplish anything you set your mind to. Good luck all you potential bloggers! [guest post] How I Get Sh*t Done!